My apologies to Mitch for the lateness of this Twart. Johnny Recon is a terrific character and I had a blast playing around with this piece (which is my clumsy nod to Al Williamson, Wally Wood and Frank Frazetta). If you want to see more Johnny (and believe me, you DO want to see more), you can make a big difference by contributing to Scott Dillon and Mitch Gerads' Johnny Recon Kickstarter campaign. It's money well-spent. That's great, Steve! The caveman bit is a nice touch, and I like the gun holster. Darn, I think this is even better than the BB piece. Man, I've been so behind on my comments. I love this! 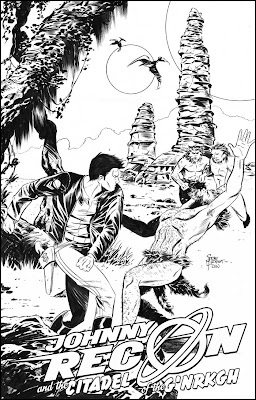 Sharp inks as usual and great job capturing that classic 50's sci-fi serial feel. YES! Oh man, you guys are giving Scott and I so many great ideas. We're both absolutely blown away by how well you've pegged our character with so little information.